Affectionately called the Il Reuccio"—the "little king" —by Neapolitans, Charles II (1661-1700), King of Spain, was the last ruler of the once mighty Spanish empire and, thus, is the last in the line of Spanish Hapsburg monarchs to rule Naples. He died without an heir and designated as his successor Phillip of Bourbon, Duke of Anjou, and nephew of the king of France. This effectively turned France and Spain (with the vicerealm of Naples) into allies, a union potentially so strong that England, Holland, and the Holy Roman Empire of Leopold I formed a Grand Alliance to fight it. This set off the Wars of the Spanish Succession, which raged across Europe until 1713. The statue in the photo is at Piazza Monteoliveto, one block up from the main post office on Via Monteoliveto. The statue was commissioned by the Spanish viceroy, Don Pietro Antonio d'Aragona and finished in 1674; the sculptor was Francesco D'Angelo. The building seen behind the statue in the photo is of extreme interest. It is part of what was once one of the largest monasteries in Italy and is, perhaps, the least written about of all such religious structures in Naples. Construction started in 1411 and over the centuries developed into a mini-city inhabited by members of the Monteolivetan order. The complex was largely broken up in the wake of the suppression of monasteries in Napoleonic Europe in the early 1800s and has undergone subsequent subdivision. The part in view behind the statue in the photo is currently a large barracks for the Carabinieri, the uniformed Italian national police force. (The dark building attached to the left of the barracks is the Church of Monteoliveto, still a church, now more commonly known as Sant'Anna dei Lombardi.) The entire complex stretched further downhill to the south for 150 yards to the main cloister of the monastery. That part of the complex is closed but was left intact and actually incorporated into the main Naples post office when that building was put up in the 1930s (photo at right). 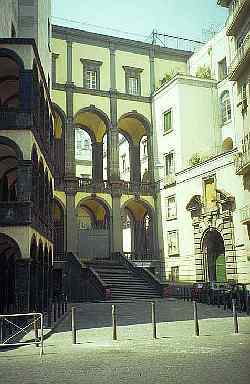 In effect, the entire modern city block surrounds the old monastery.